A Conditional 1 worksheet. As we know, Murphy’s Law is one of the governing principles of the universe. :) It states that "If anything can go wrong, it will." Storm chasers, just like anyone else, are subject to Murphy’s Law. 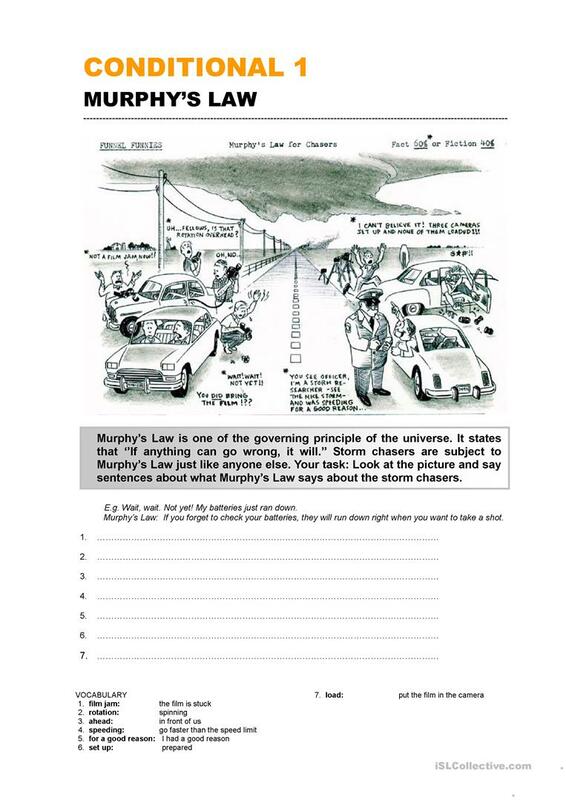 Your studentÂ´s task is to look at the picture and create relevant Murphy’s Laws about their situation. This downloadable teaching material is recommended for high school students at Pre-intermediate (A2) and Intermediate (B1) level. It is aimed at practising Conditional 1 (first conditional) and Conditionals in English. It centers around the vocabulary topic of Accidents.